We are so proud of our NWC scholarship winners, including Yvelande Astreide who is an Administrative Assistant at the Taste of Immokolee while pursuing her business degree at FSW. 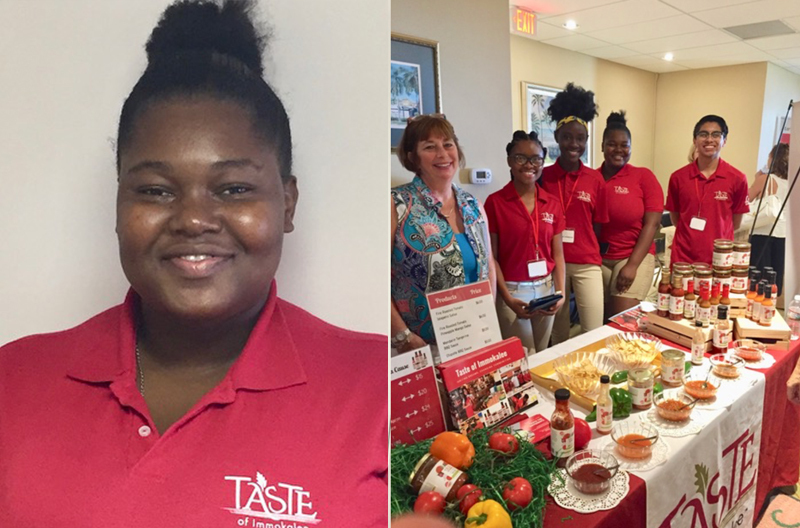 Yvelande worked with her team mates at the Taste of Immokalee booth at our Holiday Artisan Boutique and took time to tell me her story. She graduated from Immokalee High School, and received one of the NWC scholarships to study business at FSW. She worked with “Taste” during her senior year of high school and has continued to work with them part time as she continues her studies. She would like to go on in business. In addition to Yvelande, members of the college board include NWC scholarship winner Erick Garcia, and several others. Taste of Immokalee was created in 2014 when a group of students had the idea that they could create food products from the produce grown in Immokalee. Taste has grown into a successful social enterprise model, where under the guidance of mentors and business professionals, the students create and sell food products inspired by the local crops. Proceeds are directed back at the community to help spur entrepreneurship, business skill development, and address poverty in the region. For more information about Taste, see their website at https://www.tasteofimmokalee.com. The salsas, hot sauces and BBQ sauces can be purchased on line, and are also sold in local stores. Their sales at the Holiday Artisan Boutique booth were brisk!